Our kiln dried oak board is dried to 8 - 10% moisture. It is suitable for internal flooring (when suitably finished), furniture making or any internal use where a very low moisture content is desirable. We can supply any amount from single pieces to full container/truck loads, it is produced from sustainably cropped European woodlands and is beautifully grained and available in all grades. Rustic oak is perfect for all types of uses including solid oak flooring and furniture production. 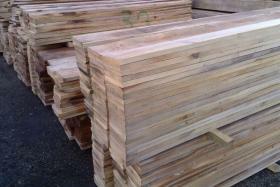 Click the link for more information about our kiln dried oak including railway sleepers. of the timber or 25mm or equivalent. Slope of grain permitted. Our kiln dried oak makes great solid oak floorboards with a lovely character. A few knots, slight imperfections and plenty of character!! Available in many widths, thicknesses and random lengths. Kiln dried to 8% moisture.